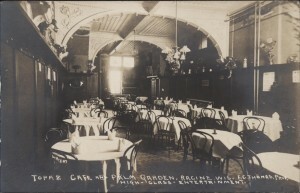 Here’s a great postcard that caught my eye — the Topaz Cafe and Palm Garden, Racine, Wis. F. C. Thomas, Prop. High – Class – Entertainment. 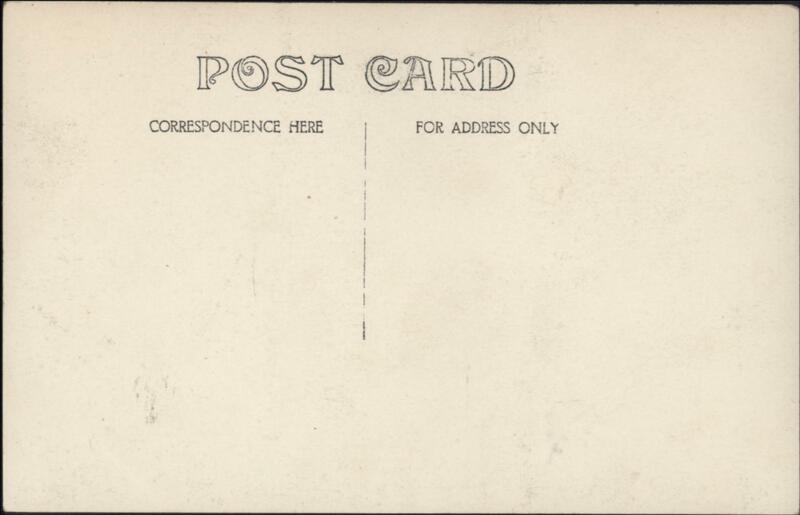 This looks to me like a pre-1920 postcard because of the instructions on where to write. 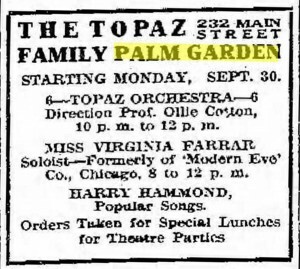 I’ve looked in the Racine City Directory for 1906 and 1916, but I don’t see any Topaz cafe. 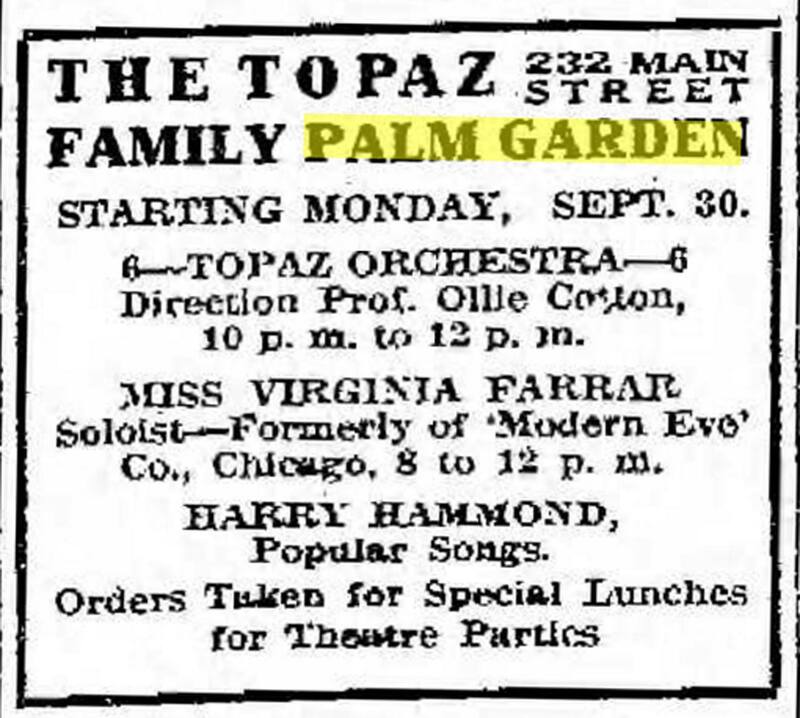 The 1945 directory has a Topaz Arcade at 232 S. Main, but that seems like a long time between pre-1920 and 1945. Things I see in the picture (scanned at 600 dpi): a marionette on the high shelf on the right near the arch and the beer stein. Lots of flowers, and a piano on a raised stage in the back. 1939 City Directory: 232 S Main is the Topaz Arcade tavern. 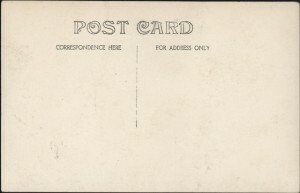 Christina Tremmel-Pruneda: The first mention at newspaperarchive.com is on 12/16/1908 with the Racine Daily Journal. Lists the address as 282 Main Street. There are many references to orchestras and singers with “limited” engagements. It sounds like vaudeville entertainment. 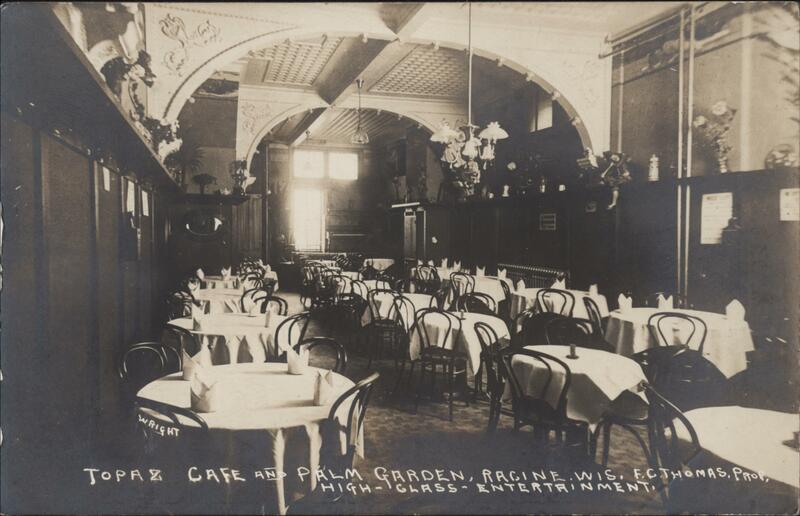 Then on 6/6/1914 The Racine Journal News reports there is new management and they are re-applying for a liquor license because they were serving liquor to a minor girl. The owner was Fred C Thomas. Nothing after 1943. Dennis Tully: The Topaz was located at 232 Main St. in the early 1900’s. Here is a newspaper ad from 1914.